The US, UK and France jointly launched strikes against targets at three sites in Syria in the early hours of Saturday morning, following a week of threats of retaliation for an alleged chemical weapons attack on civilians in the Damascus enclave of Douma, reported CNN. "I ordered the US armed forces to launch precision strikes on targets associated with the chemical weapon capabilities of Syrian dictator Bashar al-Assad," Trump said late Friday at the White House. Three targets were hit in Syria, including a scientific research center located in the greater Damascus area, and two sites near Homs, the Pentagon said. General Joseph Dunford, chairman of the US Joint Chiefs of Staff, told reporters at a Pentagon briefing that the first allied strike targeted a scientific research center in greater Damascus involved in the development and production of chemical weapons. The US President said the strikes were in coordination with France and the United Kingdom, adding that the purpose of the campaign is to "establish a strong deterrent against the production, spread and use of chemical weapons." UK Prime Minister Theresa May said in a statement that she "authorized British armed forces to conduct coordinated and targeted strikes to degrade the Syrian Regime's chemical weapons capability and deter their use. "The UK element of the carefully co-ordinated joint action was contributed by four Royal Air Force Tornado GR4s," a statement from the UK Ministry of Defense said. 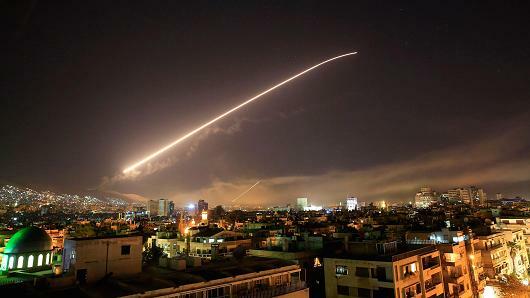 "They launched Storm Shadow missiles at a military facility -- a former missile base -- some fifteen miles west of Homs, where the regime is assessed to keep chemical weapon precursors stockpiled in breach of Syria's obligations under the Chemical Weapons Convention." Meanwhile, Canadian Prime Minister, Justin Trudeau backed the action from US and its allies.